Are you having a picnic, backyard party or corporate event? Do you need ideas to make it so much fun? 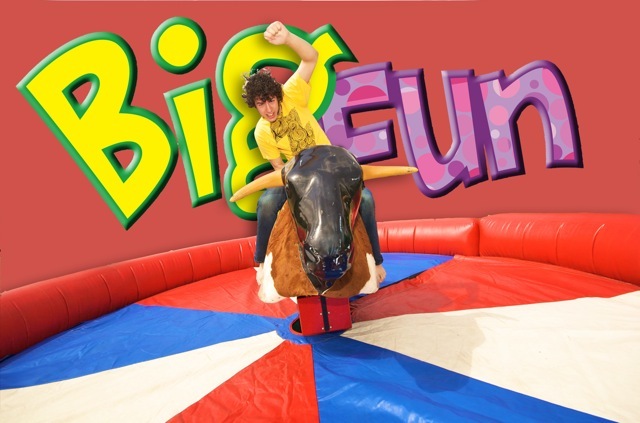 Well, we have great news for you at Bigfun.com.au; a mechanical bull for hire! Gone are the days when people were of the opinion that mechanical bulls can only be found in pubs or bars and are for drunken wannabe cowboys. With modernization and technology, mechanical bulls have been customized to suit all events and ages. The best celebrations should include something a little bit extra; something fun and breathtaking that would have all tongues wagging and everyone talking about your event. The only way you can make a statement and have an unforgettable and memorable event is by doing something out of the ordinary or something that everyone would love; something like hiring a mechanical bull. Setting up a mechanical bull at your party is going to draw a lot of attention, and all your guests will have fun memories to reminiscence on in forthcoming months or years. Everyone is always excited to try a bucking bull ride, and by everyone, I mean first timers and people who have experienced riding a mechanical bull before. Watching someone ride a bull always makes it seem like it’s an easy task, riding the bull by oneself brings about the understanding that it is not. The excitements that a mechanical bull can offer are indescribable and beyond measure; just imagine the adrenaline rush! Mechanical bulls mimic the motions of rodeo bulls and are safe for both adults and children who are five years and older. The fact that every fall would be on a soft, comfortable bed makes it more exhilarating, and people throw all caution to the wind, enjoying the ride as best as they can. The soft beds have also eliminated the fear of accidents and broken bones, another reason to have fun while enjoying the ride. Another thing that makes riding a bucking bull so much fun is making it a competition; everyone wants to be the winner, and they all keep trying to beat their records. You could even place a price tag for the winner! The price is a reward for the best rider, and everyone would try to get it, having so much fun while riding. When a person loses or falls off the mechanical bull, other people who are watching tend to laugh uncontrollably. This means that both the bull rider and the other guests derive fun simultaneously at the same time! A person doesn’t necessarily need to be on the bull to have a good time; everyone feels the thrill! If you live in Sydney, Melbourne, Brisbane, Canberra and Perth and you would love to hire a mechanical bull for your event, please visit us at https://bigfun.com.au/ to rent our bestseller bull. You can call give us a call to make enquiries or make use of the enquiry form on the site; we will get back to you in a few hours. Our goal at bigfun.com.au is to make your event an unforgettable mechanical bull riding experience.